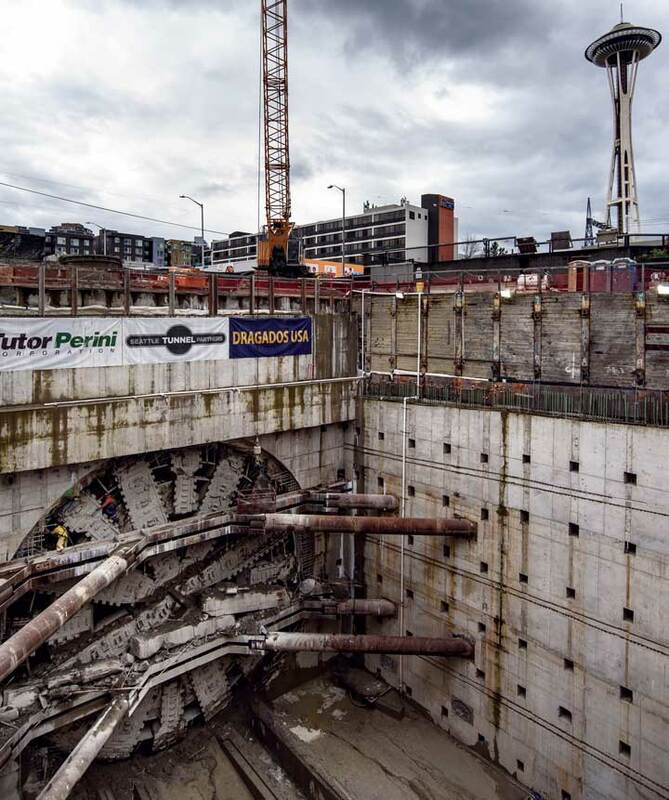 Bertha – the world’s most famous tunnel boring machine – reached her final destination among much fanfare on April 4, breaking through into the north portal near Seattle Center and the Space Needle. 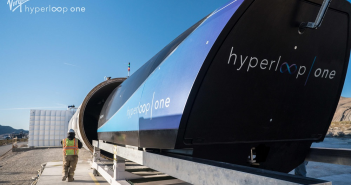 The milestone marked a significant accomplishment, ending a 9,000-plus-ft journey under downtown Seattle that began in July 2013 near the Stadium District south of town. 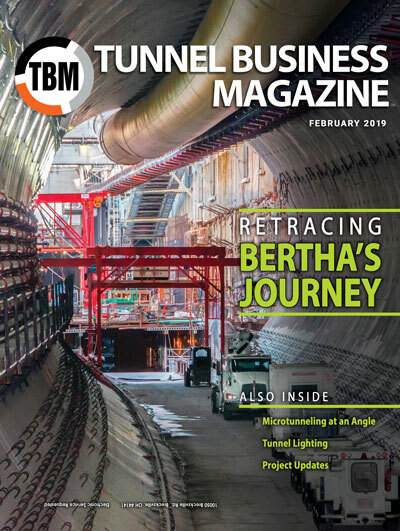 The achievement was significant not only in that Bertha is the largest TBM used to date in North America (and the largest in the world when it was built), but it involved constructing a large-diameter tunnel under a major metropolitan area through challenging ground conditions. Of course, Bertha’s struggles are well publicized, but completion of the project is good news for all involved in the project – including project owner (the Washington State Department of Transportation (WSDOT), contractor (Seattle Tunnel Partners (STP)) and businesses and citizens of the Seattle area. The successful completion of tunneling – the last ring was erected on April 21 – means that an end to the tunnel project is in sight, along with the removal of the SR 99 viaduct that hulks along Elliott Bay and the repair of a seawall that protects the historic business district along the waterfront and Pioneer Square. According to project officials, the highway is set to open to traffic by early 2019. The tunneling option allowed the viaduct to remain in service while construction of a replacement alignment occurred simultaneously. The single bore plan eliminated the time, expense and potential disruption associated with building cross passages every 600 ft along the alignment. To complete the tunnel, STP ordered the record-setting Earth Pressure Balance (EPB) TBM from Hitachi Zosen in Japan. The $80 million machine, measuring approximately 350 ft long and weighing approximately 8,000 tons, was delivered in spring 2013 and began boring on July 30 of that same year. It is interesting to note that Hitachi Zosen has a long history in TBM construction, with more than 1,300 machines delivered worldwide. Notable projects include a 46-ft diameter slurry TBM for the Trans Tokyo Bay Highway project and a 21-ft EPB TBM used on the University Link project for Sound Transit in Seattle. 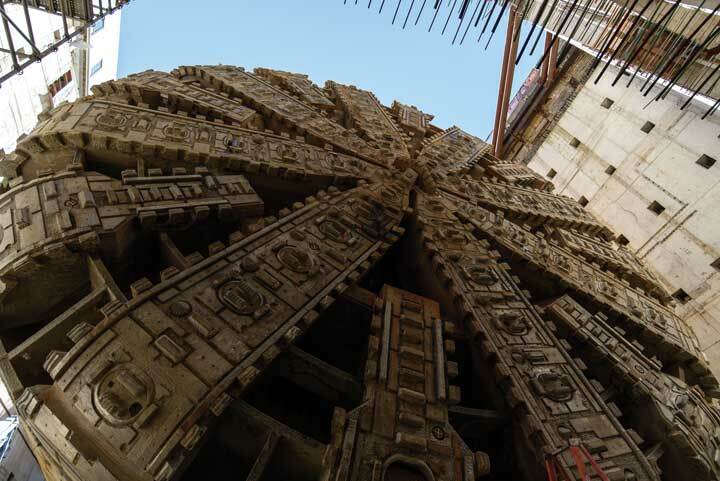 In December 2013, after excavating about 10 percent of the tunnel alignment, crews began to experience difficulties with TBM advancement, leading to an eventual shutdown and a repair plan that idled the machine for about two years. 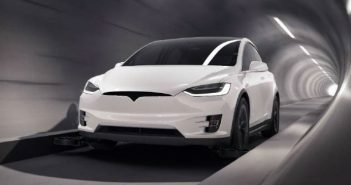 Mining resumed in December 2015, and, after a brief stoppage due to the development of a sinkhole in a work area, resumed in February 2016 to complete the remainder of the drive. In addition to the challenges associated with the ground and in a dense urban setting, tunneling at extremely large diameters brings with it unique challenges of its own. As a point of reference, the 57.5-ft diameter SR 99 TBM is more than double the size of the 21-ft TBMs used to bore subway tunnels for Seattle’s Sound Transit. “The face area of the SR 99 TBM is seven times as large as a typical TBM for subway tunnels,” said Chris Dixon, project manager for STP. “That means we are dealing with much greater quantities of muck as well as increasing significantly our volumes of materials needed for backfill grouting, soil conditioning and grease. The proximity to the Port of Seattle proved to be a blessing, allowing delivery of the large TBM components directly to the site as well as the ability to barge tunnel muck off site. The massive size of the TBM meant that at the height of production, the amount of soil excavated would require more than 200 trucks per day entering and leaving the site. STP installed a conveyor system to move tunnel muck from the TBM directly onto barges at the port, minimizing disruption on surface streets that would have resulted from trucking the tunnel muck off site. Going into the project, the challenges associated with controlling the ground were well understood. To mitigate the potential impacts of ground movement in the area near the launch portal, where cover was shallow and potential for ground movement and settlement was the greatest, STP built a “tunnel in a box” – parallel rows of secant pile walls on either side of the TBM to isolate the effects of tunneling from surrounding utilities and structures, particularly the adjacent Alaskan Way Viaduct. This “tunnel in a box” extended for approximately the first 1,500 ft shallow portion of the tunnel drive before the tunnel alignment crossed under the viaduct and went deeper into the over consolidated glacial soils that were more favorable to tunneling. Another unique element of the large diameter was the fact that it allowed crews to begin constructing the double-deck roadway in the tunnel without impeding the operation of the tunnel boring machine. This approach allowed STP to drive the tunnel and to construct the roadway concurrently instead of sequentially, thereby shortening the overall schedule for tunnel construction. 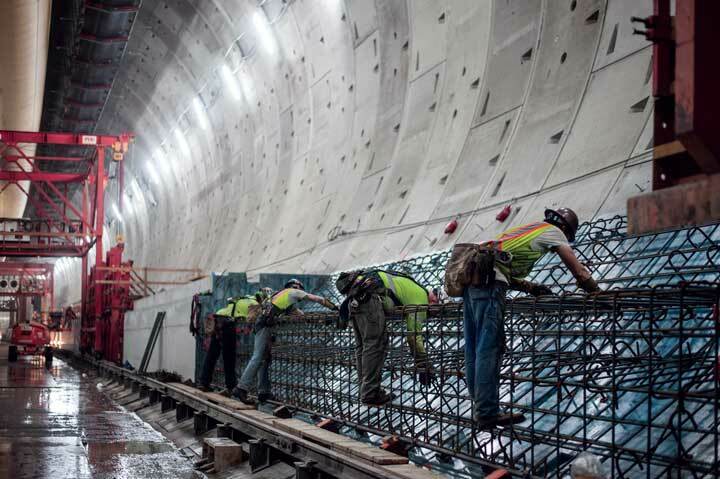 According to Joe Hedges, WSDOT’s administrator for the Alaskan Way project, at the time of the tunnel breakthrough, STP crews had completed about 60 percent of the upper deck for the roadway and with 75 percent of the foundations for the lower deck. Now that the breakthrough has occurred and the last ring has been erected, STP crews are continuing work on the interior structures as well as disassembling the TBM. Dixon estimates that disassembly will take between four to five months to complete. At that point, crews will begin installing the precast concrete panels for the lower northbound roadway deck inside the tunnel, connecting the portals to the cut-and-cover structures that transition to SR 99 on the surface, as well as completing work on the operations buildings at both the north and south ends. Jim Rush is editor of TBM.